Today was going to be a restful Sunday until I started reading some gardening blogs. These are blogs of people who live and garden in Florida, some even as far south as myself, or farther. 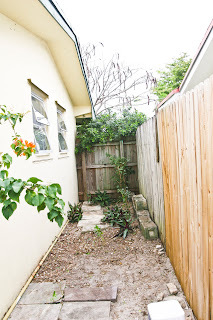 People like Danielle's Garden Blog, Hoe and Shovel, Wicked Gardener, Dragonfly Gardener, Gardening in Central Florida, and last but not least, Florida Ecomania. A couple of the above blogs are Central Florida or farther north, but one is south of me in Miami. I got as far as Dragonfly Garden this morning in my reading, before I could resist my conscience no longer. I have a Morning Glory vine from a Stephen King horror story. Years ago, when I first moved into this house, there was one corner of the yard that had a pretty deep green leaved and purple flowered vine. Since purple and green are my favorite colors together, it was serendipity. I thought. I thought wrong. That vine would not die. The neighbors who shared the other side of the vine knew better than I did and killed the stuff on their side with Round Up. I was upset at the time, but now I understand. What astounds me is that people who live north of Florida actually plant Morning Glory ON PURPOSE from seeds every year. They get a season called winter, which effectively kills off the vine every year so it has to be replanted. We don't get freezes down here, so Morning Glory becomes riotous, insanely voracious in it's ability to cover everything and smother it - it's the Kudzu of my backyard. Oh - by the way - my husband read the other day that Kudzu is growing in the Everglades - now THAT is a serious, villainous vine - I hope they can eradicate it - but, I digress. The years passed and we thought the Morning Glory was dead, since the neighbors had killed the root system, which happened to be on their side. I planted Bougainvilleas, Clerodendrum (which get carried away themselves, but that's another story), Cape Honeysuckle (someone told me I'd get hummingbirds if I planted this - but I've not seen one yet...but that, too, is another story), Confederate Jasmine, Mexican Heather, Beautyberry and wild Lantana transplanted from the Everglades. I also planted native bushes like Firebush and somthing else whose name I can't recall. Then, one day I noticed a few purple flowers and deep green leaves along the left back yard fence. Just a few. They looked pretty, so I left them. I'm a softy about anything living - usually. I can't stand to hurt living things, including bushes and trees - it's dumb and ignorant, since pruning helps trees and bushes. Anyway - I left the Morning Glory alone. Then, last spring we had cat birds in our yard. Cat birds are notorious for loving heavy brush cover. Since the Morning Glory had formed a nice covering over some bushless areas in the back yard and provided cover for the cat birds, we left it alone. Big mistake. Now it's a year later, and the Morning Glory has taken over the back yard. Runners could be seen through the grass, it covered the Clerodendrum way too high up to pull down. It covered our fence in the back yard and was beginning to smother the Bougainvillea. I looked at it in extreme dismay. My husband joked about setting fire to the back yard and then paving it. We're both in our 50's, out of shape, overweight, and bookworm-internet nuts. I'm more of an outdoor nut than he is, and I enjoy working in the yard, but we were facing a monumental task this time. I girded my loins, figuratively speaking, gave myself a pep talk, determined to wipe out the Morning Glory one step at a time. I started on the left side fence in the back yard where it was the thickest and where it was smothering my Bougainvilleas. I ripped and pulled, I trimmed the Bougainvillea. I literally, step by step, obliterated all signs of the vine and it's roots. Of course, my back was killing me for days - and each time I've gone out there for another round of Morning Glory War, I think calling 911 might be a good idea. Well, now I've got documentary evidence of my battle. I decided today to conquer the left side of the house where the fence passes between my neighbor's house and my house. The houses are about 8-12 feet apart, with the fence passing in the approximate middle of this. Weeds had sprung up on the side of the house, since it is such a narrow space and brutally hot in the summer, I rarely try to plant anything there. 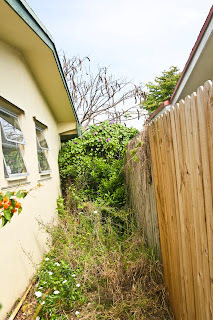 My husband, ever security conscious, thought it might be a good idea to leave the area overgrown to discourage would-be burglars from trying to climb into our windows from that side. Well, I decided it had to be cleaned up. I could see the Morning Glory juggernaut had reached the back of one of my favorite bushes that line the front of the house. The Morning Glory was moving up - and I had to stop it. Below is a before picture of the side of the house at about 11:00AM this afternoon. As usual, click on the picture for a bigger, more detailed view. Now for the after picture - taken about 3:00PM. My husband joked that we should have taken a before and after picture of me, too - but I'll save that for another time. Pretty good, huh? Does anyone out there have any suggestions for something to plant on that side? It gets brutal sun in summer for a number of hours. Now that the left side of the backyard fence is completely done and also the left half of the fence along the back of the yard, I'm ready to start on the right side, which isn't as bad. I also need to weed along the back of the house itself, and along the edge of the outside of the back porch. Every week, I inspect the areas I've already de-Morning Glory'd to make sure no little shoots are coming up - I've caught two tiny ones and promptly ripped those suckers right up. That's the saga so far - now for some Biofreeze and a heating pad. Decorative cactus my dear - that will certainly discourage any would be robbers and should flourish in the hot hot sun. . . .
That's a great idea - the only problem I can see is when I try to weed. I already get ripped to shreds when I weed around the Bougainvillea. What's a little cactus, then.....I think I'll give it a try - it should deter anyone! ooh we dont plant morning glories because they do tend to take over, although i do see the seeds in the stores. If only I had known......now I'm fighting for every inch! Wow! You've been busy posting! Hello and welcome! What a wonderful suggestion - I love the way it looks (I looked it up) and I have to see if anyone sells it down here. If they do, I'm sold - I'll plant it on that side of the house - what a great idea - thanks!! I haven't planted anything there - and it has to be weeded again - it's all overgrown.